Digitalis purpurea Excelsior hybrids is the most spectacular strain of mixed colours, superb for shady shrub and tree areas, back of borders and excellent for cut flowers. This biennial grows to 5 feet tall and is native to Europe. 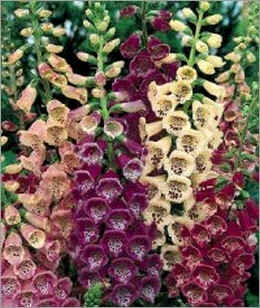 Tall Foxglove plants in white, cream, purple and pink shades. Flowers completely circle the stems and are held horizontally to show-off beautiful interior spotting. Flowers early Summer. Leaves are produced in the first year and the tall spikes of flowers the second year.